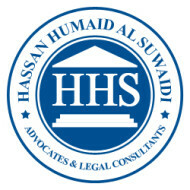 Hassan Elhais; General Law Practice; English & Arabic; Dubai, U.A.E. Ahmed Abdul Karim Bin Eid; Full Service Law Firm; English & Arabic; Dubai, U.A.E. Hammad Ebrahim Hassan Al Shaiba; Employment & Business Law; English & Arabic; Dubai, U.A.E. HHS lawyers; Criminal, Commercial, Family & Litigation Law; English & Arabic; Dubai, U.A.E.